Designed for use with Holley 2-bbl Pro-Jection throttle bodies. Installation Notes: Utilizes late model alternator and A/C bracket mounting provisions. Has vacuum taps off manifold runners. Extra installation hardware included. 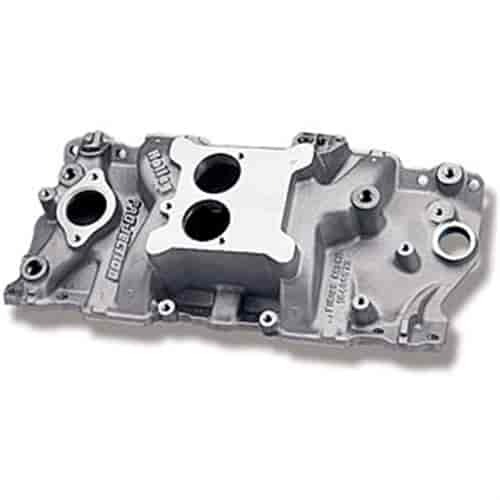 Designed for use with 2-barrel Pro-Jection throttle bodies, these manifolds utilize a high rise/dual plane design. Note: These manifolds are NOT intended as an O.E. replacement for 1987-later fuel injected trucks. Does Holley 300-49 fit your vehicle? 300-49 is rated 4.5 out of 5 by 2. Rated 4 out of 5 by Beard3d1 from Original bolts will not clear one runner. I used locking cap bolts as a substitute. There is one vacuum port. My truck used this exact port for a trans kick down. The directions state this is for the brake booster. I made a T fitting to run both to the same port. Doing this required me to run a new booster line. I had to reroute my heater core coolant line to work with this manifold. Otherwise works great. 1987-Up With Aluminum Cylinder Heads; not cast iron . many truck applications are cast iron.